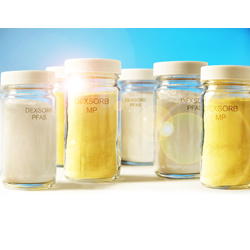 The Dexsorb line of cyclodextrin-based adsorbents selectively targets and removes hazardous micropollutants from drinking water. The adsorbents safely eliminate harmful chemicals, such as PFAS, PFOS, pesticides and pharmaceutical compounds. They can be produced in varying particle sizes tailored to different filtration and water flow requirements, allowing their use across a range of water purification applications.